This week Kim and Kanye threw a family barbecue, Drake performed a surprise set in Toronto and Stormzy celebrated an incredible weekend. 1. 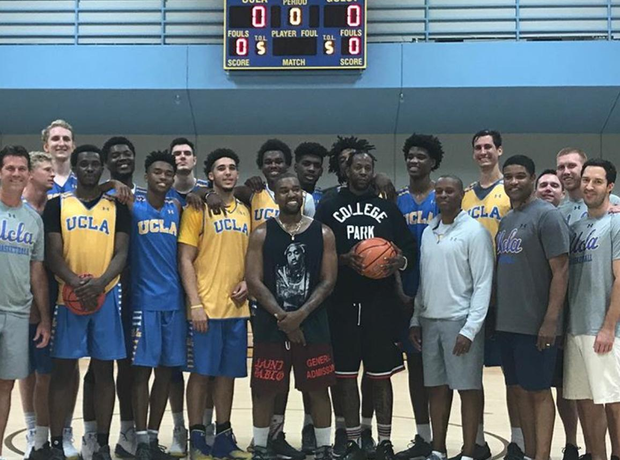 Kanye West & 2 Chainz met the UCLA Men's basketball team during a practice session. 2. Kanye West cracked a rare smile while meeting players and coaches. 5. Yeezy was all smiles, pictured here alongside friend and fellow rapper 2 Chainz. 6. Drake made a surprise appearance on stage at the Canada 150 concert in Toronto. 7. Stormzy celebrated a successful weekend of performances. 8. Calvin Harris appeared on a billboard in New York City. 9. The Scottish DJ hosted an album launch party to celebrate the record's release. 11. Nicki Minaj reflected on her night at the NBA Awards after party. 12. Meanwhile, Meek Mill was spotted racing around on a Raptor quad bike. 13. Ne-Yo and Wale were chilling poolside at Rick Ross' house over the weekend.